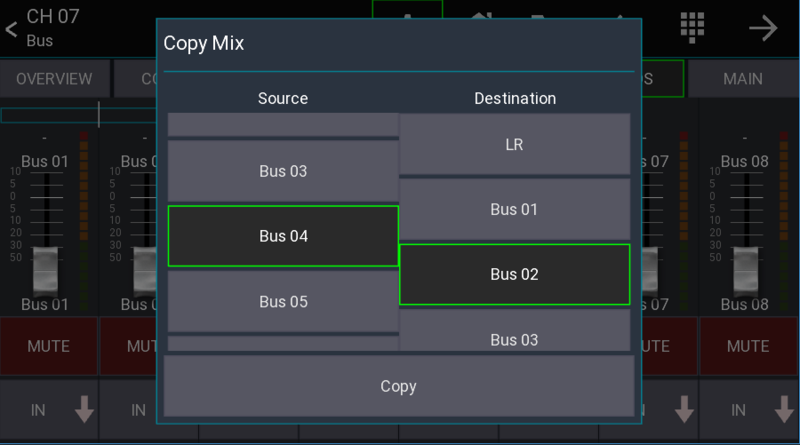 The mix copy feature lets you copy a mix to another mix. This is useful when you want to use the LR mix as a starting point for an in-ear mix or if you simply want to copy a monitor mix to another monitor mix. To use the mix copy feature open any channel and select "SENDS". Then press the gear icon in the top menu bar and select "Mix Copy". On the Source side select the mix which you want to copy. On the Destination side select the mix where the data should be pasted to. Press the Copy button to start the copy process. The target mix will be muted. This is a safety feature to avoid feedback or a sudden increase in volume. Don't forget to unmute the target mix!